Crimean-Congo hemorrhagic fever (CCHF) is a serious infectious disease with a mortality rate of 3%-50% worldwide. This infection is caused by RNA virus from the Nairovirus species of the Bunyaviridae family. This virus is endemic in especially Middle Asia, and Southeastern Europe. CCHF infection is manifested by microvascular deterioration and afflicted homeostasis. Although the pathophysiology of CCHF is not understood properly. The clinic and severity of the disease emerge from endothelial damage and impaired immune response. Interleukin-1 (IL-1) is important for inducing inflammatory and immunological process. IL-1Ra is an antagonist of the pro-inflammatory cytokines and inhibits the activity of IL-1. Therefore IL-1Ra lowers the detrimental actions of IL-1 throughout the inflammatory process. It has been reported that a variable number of tandem repeats (VNTR) of 86 bp variant (rs2234663) are located in intron 2 of the IL-1Ra gene. This variant results in the presence of five alleles and each of them corresponds to a distinct number of repeats. The number of repeats has functional importance since repeats consist of binding sites for transcription factors. IL-6 is a significant regulator of acute phase response. IL-6 is synthesized by activated macrophages, monocytes, and lymphocytes. It has been reported that IL-6 expression could be genetically controlled by polymorphisms found at positions rs1800795, rs1800796 and rs1800797 (aka IL-6 -174GC, -572GC, -597GA). Owing to different cytokines which have an important function in the control of immune response and defense against viruses, we aimed at exploring the correlation between IL-1Ra VNTR (rs2234663), IL-6 -597GA (rs1800797), and IL-6 -572GC (rs1800796) variants and CCHF susceptibility in a Turkish cohort. The current study was approved by the Ethics Committee of Tokat Gaziosmanpasa University (number 16/KAEK/031). Fifty CCHF patients [21 female, 29 male; mean age: (37.94±12.54) years] with RNA positivity were recruited from Infectious Diseases and Clinical Microbiology Department at Tokat Gaziosmanpasa University in Tokat, Turkey. Detailed clinical history and laboratory examinations were evaluated for each patient. 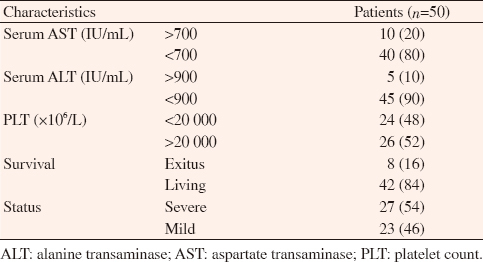 In addition, alanine transaminase (ALT), aspartate transaminase (AST), platelet count (PLT) of patients were also evaluated. Fifty age-matched healthy individuals were recruited as controls [28 female, 22 male; mean age of (36.68±12.32) years]. Control group were selected from those with no history of acute or chronic disease and the absence of any other viruses, disorders. Subjects living in the Central Black Sea Region, older than 18 years were included in the present study. There was no significant difference in terms of age and gender among patients and the control. All the serum specimens were stored at -20 °C until testing. RNA was collected with the Bosphore CCHF virus Quantification Kit (Anatolia Geneworks, Turkey). Lyophilized proteinase K and carrier RNA were liquefied with buffers and RNase free water. The carrier RNA was mixed with RNase free water (1 000 μL). Patient serum (400 μL) was added to carrier RNA (1 mg/mL, 10 μL) and proteinase K (10 mg/mL, 20 μL). RNA isolation was performed on the Magnesia 16 isolation device (Anatolia Geneworks, Turkey) in accordance with the manufacturer's recommendation. All collected RNAs were stored at +4 °C if used within a short period of time or at -20 °C. Genomic DNA was isolated from venous blood using a DNA extraction kit following the manufacturer's standard protocol (Sigma-Aldrich, St. Louis, MI, USA). IL-1Ra VNTR variant was detected according to Tarlow et al. Genotyping for IL-1Ra VNTR variant was performed using polymerase chain reaction (PCR). PCR was performed in a 25 μL final volume (25 pM of each primer, 0.1 mM of dNTP, 0.5 μg of genomic DNA, 1.5 mM of MgCl, 2.5 μL of PCR buffer and 1.5 unit of Taq DNA polymerase) PCR steps were implemented as follows: initial denaturation at 94 °C for 4 min; 30 cycles of denaturation at 94 °C for 45 s, annealing at 51 °C for 30 s, and extension at 72 °C for 45 s; and final extension at 72 °C for 5 min. Two oligonucleotide primers F: 5′-CTC AGC AAC ACT CCT AT-3′ and R: 5′-TTC CAC CAC ATG GAA C-3′ based on flanking region of the IL-1Ra were used. The PCR products were analyzed by 3% agarose gel electrophoresis. Five different alleles of IL-1Ra were defined as follows: allele 1, four repeats (410 bp); allele 2, two repeats (240 bp); allele 3, five repeats (500 bp); allele 4, three repeats (325 bp); allele 5, six repeats (595 bp). The IL-6 -597GA (rs1800797) and -572GC (rs1800796) variants were genotyped by PCR based-restriction fragment length polymorphism (RFLP) analysis. The primers used for IL-6 -597GA and -572GC variants were (F): 5′-CAG CAG CCA ACC TCC TCT AA-3′ and (R) 5′-AAA CCA GAC CCT TGC ACA AC-3′. The cycling conditions for IL-6 -597GA and -572GC variants were 40 cycles of 30 s at 95 °C, 30 s at 62 °C and 1 min at 72 °C. As the IL-6 -597GA, the G to A transition was identified with Fok I, the A allele yielded fragments of 136 and 88 bps. As the IL-6 -572GC, the G to C transversion was identified by digestion with BsrBI, producing for the G allele fragments of 150 and 74 bps. All statistical analyses were evaluated by Statistical Program Version 15.0 (SPSS Inc., Chicago, Illinois, USA) and OpenEpi info software package program. Genotype distributions and allele frequencies were evaluated by Chi-square statistic and Fisher's exact tests. P< 0.05 value was considered significant. This study represented 50 CCHF patients and 50 healthy subjects as the control group. The clinical features of the cases were demonstrated in [Table 1]. The genotypic and allelic frequencies of this VNTR variant were shown in [Table 2]. IL-1Ra VNTR variants were recognized as five types of alleles: 1 (four repeats, 410 bp), 2 (two repeats, 240 bp), 3 (five repeats, 500 bp), 4 (three repeats, 325 bp) and 5 (six repeats, 595 bp). In the present study, because of the differences of 86-bp tandem repeat number, five types of alleles could be established in this study. IL-1Ra 1 and 2 alleles were the most common meanwhile, other alleles were rare. The genotype frequencies of the VNTR IL-1Ra variant in the patients were as follows: 28 individuals (56%) were 1/1 genotype, 16 (32%) were 1/2 genotype, 2 (4%) were 2/2 genotype, 3 (6%) were 1/3 genotype, 1 (2%) were 2/5 genotype. The genotype frequencies of the VNTR IL-1Ra variant in the controls were as follows: 27 individuals (54%) were 1/1 genotype, 16 (32%) were 1/2 genotype, 5 (10%) were 2/2 genotype, 1 (2%) was 2/4 genotype and 1 (2%) was 2/3 genotype. Genotypic and allelic frequencies of the IL-1Ra VNTR variant did not show significant differences between the study groups (P > 0.05). 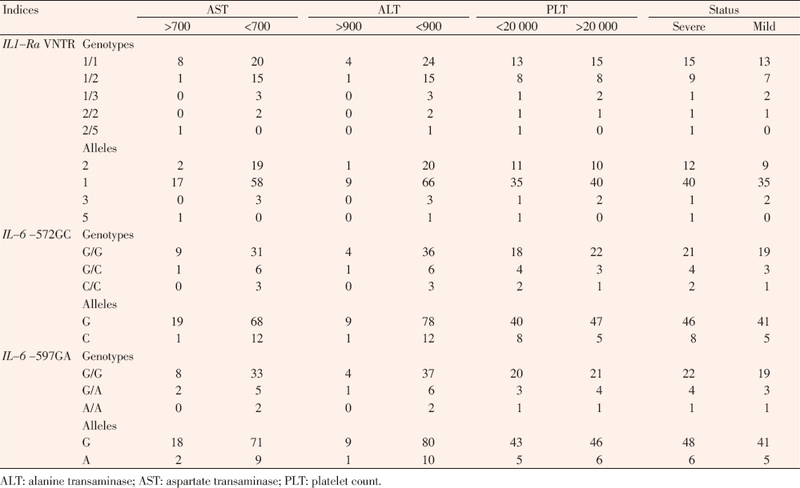 Table 1: Clinical characteristics of patients [n (%)]. Table 2: Genotype and allele frequencies of IL-1Ra VNTR variant in groups [n (%)]. The distributions of genotype and allele frequencies of the IL-6 -597GA and -572GC in CCHF and the control group were shown in [Table 3]. Genotypic and allelic frequencies of the IL-6 -597GA variant did not show significant differences between the study groups (P>0.05). A significant difference was observed in the IL-6 -572GC genotype and allele distributions between groups. CCHF infected patients had a significantly higher frequency of IL-6 -572GC GG genotype (P=0.006; OR: 3.69, 95% CI: 1.53-8.89) and G allele (P=0.014; OR: 2.60, 95% CI: 1.26-5.37) than healthy controls. IL-6 -572GC GC genotype was more frequent in control group compared to CCHF patient group (P=0.006; OR: 0.24, 95% CI: 0.09-0.64) [Table 3]. Table 3: Genotype and allele frequencies of IL-6 -597GA and IL-6 -572GC variants in groups [n (%)]. Clinical and laboratory data of patients were also analyzed according to IL-1Ra, IL-6 -572GC, and IL-6 -597GA genotype distribution and shown in [Table 4]. Triple, binary genotype and haplotype combinations for the IL-1Ra, IL-6 -572GC, and IL-6 -597GA loci were demonstrated. 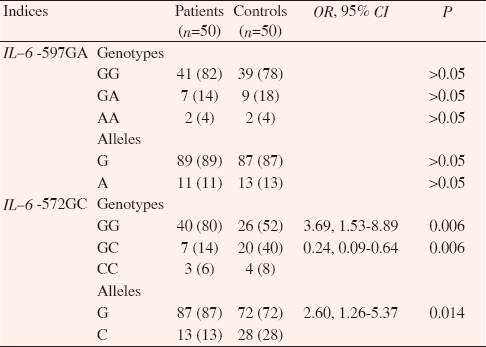 The 1/2-GC-GG genotype combination was demonstrated more frequently in the control group than CCHF patients (18% vs. 2%, P=0.016; OR: 0.09, 95% CI: 0.01-0.75) [Table 5]. There was a significant difference between patients and the control group with the frequencies of binary genotypic and haplotypic characteristics, especially for the IL-6 (-572/-597) GG-GG and GC-GG loci. The GG-GG genotype was significantly higher in the patients (68% vs. 42%, P=0.015; OR: 2.93, 95% CI: 1.31-6.59). The GC-GG genotype was significantly lower in the patient group compared to the control (8% vs. 32%, P=0.005; OR: 0.18, 95% CI: 0.06-0.60). Additionally, the G-G haplotype was detected significantly higher in the patient group (P=0.042; OR: 1.99; 95% CI: 1.07-3.71). 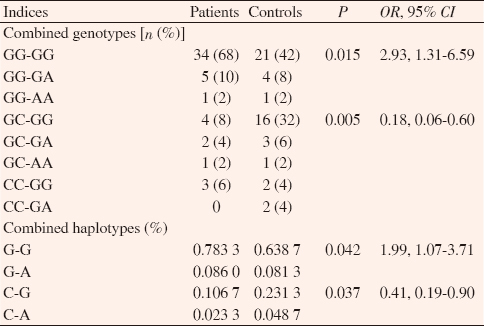 The other haplotype, C-G, was significantly lower in patients than in the control group (P=0.037; OR: 0.41, 95% CI: 0.19-0.90) [Table 6]. Table 4: Clinical and laboratory data for IL-1Ra, IL-6 -572GC, and IL-6 -597GA genotypes (n). 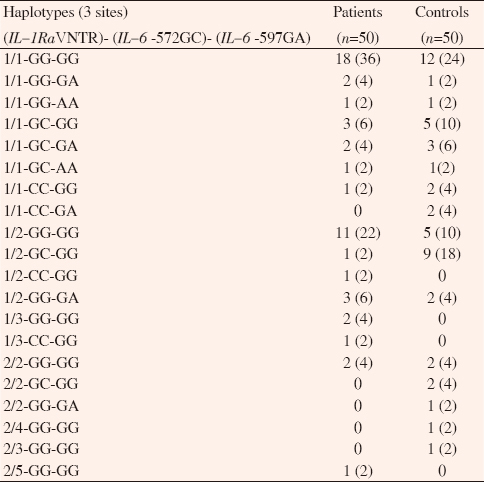 Table 5: Haplotype frequencies in patients and controls [n (%)]. Table 6: Comparative analysis of IL-6 -572GC and -597GA haplotypes. The pathogenesis of CCHF is not well established. Within minutes after the invasion of the host by the pathogenic agent, the innate immune system is activated and the host defense remains active during the infection. Endothelial damage may take place either directly by the invasion of viruses or indirectly owing to chemokines and cytokines emerged from the activated mononuclear cells. Pro-inflammatory cytokines induce adaptive immunity and facilitate T-cell regulation and tolerance formation. IL-1Ra is involved in terminating the acute pro-inflammatory event and prevents chronic inflammation from injuring healthy cells. IL-1Ra levels are increased in inflammatory conditions and correlate with their activity and therapies. The significance of IL-1Ra as an anti-inflammatory mediator is also supported by data on patients with mutations in this protein, in whom loss of IL-1Ra leads to very serious systemic inflammation. The relationship between IL-1Ra and various viral infections was evaluated in the literature. Some studies reported that the release of high amounts of the IL-1Ra is correlated with the fatal outcome of Ebola virus infection in humans, or with high viral titers and mortality in mice infected with mouse-adapted Ebola virus. Ebola virus belongs to the same family as CCHF virus. Also, it was detected that blood IL-1Ra levels were higher in Dengue virus-infected patients as compared to controls. Lai at al. indicated IL-1Ra was associated with the development of liver inflammation, which was reduced in patients with hepatitis B related liver failure and invertedly associated with disease severity. Transcription activity of IL-1Ra is enhanced with the number of repeat because of increase in the binding sites for transcription factors. The amount of IL-1Ra synthesis in human endothelial cells with the 2/2 genotype is three times less than in cells with the 1/1 genotype; an intermediate level of this protein is recorded in cells with the 1/2 genotype. Zhang et al. reported IL-1Ra 1/2 genotype and IL-1Ra allele 2 were significantly lower in chronic hepatitis B than the control group. Witkin indicated amounts of HIV-1 RNA in the blood were significantly lower in the patients who were IL-1Ra 2 homozygous compared to the other IL-1Ra genotypes. In the present study, we analyzed the possible correlation of IL-1Ra VNTR, IL-6 -572GC, and -597GA variants with CCFH in Turkish patients. There are not many studies on this issue in the literature. We observed there was not a significant difference in terms of IL-1Ra genotype and allele frequencies between the patients and the healthy control group (P>0.05). IL-6 has an important role in immunoregulation. Also, IL-6 deficiency can lead to dysfunctional innate and adaptive immunity as opposed to many infections. In 2017, Meng et al. indicated that serum level of IL-6 was elevated in patients with HBV-infection. Elevated IL-6 levels might indicate more active hepatic necroinflammation and be correlated with the manifestation and severity in chronic HBV infection. IL-6 also plays a role as a growth factor for Epstein-Barr Virus-infected B cells, leading to elevated Ig synthesis. Another study conducted in 2017 indicated Epstein-Barr virus-induced gene 3 (EBI3) can support IL-6 functions by mediating trans-signaling. Sghaier et al. found that carriage of IL-6 rs1800796 GG genotype, IL-6 rs1474358 C-allele, and IL-6 rs1800797 A-allele was more frequent in chronic hepatitis C virus infection than hepatocellular carcinoma. Attar et al. demonstrated that there was a significant difference in the frequencies of IL-6 -174GC GG genotype and G allele between HBV infected patients and the control group. Also, a significant association between IL-6 variant was shown by Fabris et al. in HBV infection and Cussigh et al. in HCV infection. Wujcicka et al. showed the prevalence rate of IL-6 -174GC GC genotype was significantly decreased among the human cytomegalovirus infected, compared to the uninfected control subjects in 2017. There was a significant relationship between the IL-6 rs1818879 GA heterozygous genotype and serious influenza A (H1N1) infection. For IL-6 -572GC, the controls with spontaneous clearance of HBV have significantly higher allele G and GG genotype frequency compared to the chronic HBV infection patients. In this study, it was found that the patients carrying IL-6 -572GC GG genotype and G allele had 3.69 and 2.60-fold increased risk developing CCHF compared to the control group, respectively. 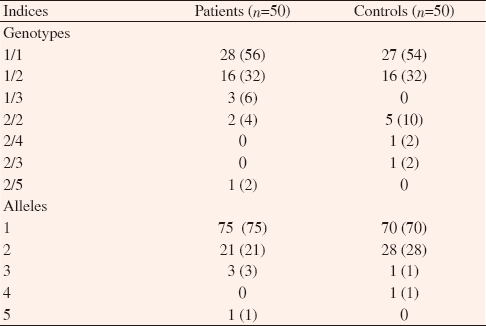 IL-6 -572GC GC genotype was higher in control group than patients (P=0.006). This may be considered as heterozygous advantage. Besides, we evaluated the clinical and laboratory parameters of patients according to genotype distribution of these variants and triple, binary genotype and haplotype combinations for these loci. It was found that 1/2-GC-GG genotype combination was more often in control than in the CCHF patients (P=0.016). For IL-6 gene variants, the GG-GG genotype was significantly higher in the patient group (P=0.015), although the GC-GG genotype was significantly lower in the patient group (P=0.005). Also, G-G haplotype was higher in the patient group (P=0.042), while C-G was lower in patients (P=0.037). It was thought GC-GG genotype and C-G haplotype facilitate greater protection against the disease. To our knowledge, the present study is the first evaluation that investigated the relationship between IL-1Ra VNTR, IL-6 -572GC, -597GA variants and CCHF in a Turkish cohort. This study showed the IL-6 -572GC variant might be a strong genetic sensitivity marker for the development of CCHF in Turkish population. We believe that present study will serve as a premise for similar research. In future trials, both other cytokine and cytokine receptor gene variants should be investigated for the comprehension of the factors that have an important function in CCHF disease. Ergonul O. Crimean-Congo haemorrhagic fever. Lancet Infect Dis 2006; 6(4): 203-214. Doi:10.1016/S1473-3099(06)70435-2. Akinci E, Bodur H, Sunbul M, Leblebicioglu H. Prognostic factors, pathophysiology and novel biomarkers in Crimean-Congo hemorrhagic fever. Antiviral Res 2016; 132: 233-243. Doi: 10.1016/ j.antiviral.2016.06.011. Dinarello CA. Biology of interleukin 1. FASEB J 1988; 2(2): 108-115. Tarlow JK, Blakemore A, Lennard A, Solari R, Hughes H, Steinkasserer A, et al. Polymorphism in human IL-1 receptor antagonist gene intron 2 is caused by variable numbers of an 86-base pair tandem repeat. Hum Genet 1993; 91(4): 403-404. Pawlik A, Wrzesniewska J, Florczak M, Gawronska-Szklarz B, Herczynska M. IL-6 promoter polymorphism in patients with rheumatoid arthritis. Scand J Rheumatol 2005; 34(2): 109-113. Reiner AP, Wurfel MM, Lange LA, Carlson CS, Nord AS, Carty CL, et al. Polymorphisms of the IL1-receptor antagonist gene (IL1RN) are associated with multiple markers of systemic inflammation. Arterioscler Thromb Vasc Biol 2008; 28(7): 1407-1412. Doi: 10.1161/ ATVBAHA.108.167437. Wauquier N, Becquart P, Padilla C, Baize S, Leroy EM. Human fatal zaire ebola virus infection is associated with an aberrant innate immunity and with massive lymphocyte apoptosis. PLoS Negl Trop Dis 2010; 4(10): e837. Doi: 10.1371/journal.pntd.0000837. McElroy AK, Erickson BR, Flietstra TD, Rollin PE, Nichol ST, Towner JS, et al. Ebola hemorrhagic fever: Novel biomarker correlates of clinical outcome. J Infect Dis 2014; 210(4): 558-566. Doi: 10.1093/infdis/jiu088. Cilloniz C, Ebihara H, Ni C, Neumann G, Korth MJ, Kelly SM, et al. Functional genomics reveals the induction of inflammatory response and metalloproteinase gene expression during lethal Ebola virus infection. J Virol 2011; 85: 9060-9068.
de-Oliveira-Pinto LM, Gandini M, Freitas LP, Siqueira MM, Marinho CF, Setúbal S, et al. Profile of circulating levels of IL-1Ra, CXCL10/IP-10, CCL4/MIP-1 β and CCL2/MCP-1 in dengue fever and parvovirosis. Mem Inst Oswaldo Cruz 2012; 107(1): 48-56. Lai J, Liu Y, Pan C, Lin C, Sun F, Huang Z, et al. Interleukin-1 receptor antagonist expression is inversely associated with outcomes of hepatitis B-related acute-on-chronic liver failure. Exp Ther Med 2017; 13(6): 2867-2875. Doi: 10.3892/etm.2017.4361. Dewberry R, Holden H, Crossman D, Francis S. Interleukin-1 receptor antagonist expression in human endothelial cells and atherosclerosis. Arterioscler Thromb Vasc Biol 2000; 20(11): 2394-2400. Zhang PA, Li Y, Xu P, Wu JM. Polymorphisms of interleukin-1B and interleukin-1 receptor antagonist genes in patients with chronic hepatitis B. World J Gastroenterol 2004; 10(12): 1826-1829. Witkin SS, Linhares IM, Gerber S, Caetano ME, Segurado AC. Interleukin-1 receptor antagonist gene polymorphism and circulating levels of HIV-1 RNA in Brazilian women. J Virol 2001; 75: 6242-6244. Hoge J, Yan I, Jänner N, Schumacher V, Chalaris A, Steinmetz OM, et al. IL-6 controls the innate immune response against Listeria monocytogenes via classical IL-6 signaling. J Immunol 2013; 190: 703-711. Meng Z, Zhang Y, Wei Z, Liu P, Kang J, Zhang Y, et al. High serum resistin associates with intrahepatic inflammation and necrosis: An index of disease severity for patients with chronic HBV infection. BMC Gastroenterol 2017; 17(1): 6. Doi:10.1186/s12876-016-0558-5. Yokoi T, Miyawaki T, Yachie A, Kato K, Kasahara Y, Taniguchi N. Epstein-Barr virus-immortalized B cells produce IL-6 as an autocrine growth factor. Immunology 1990; 70: 100-105. Chehboun S, Labrecque-Carbonneau J, Pasquin S, Meliani Y, Meddah B, Ferlin W, et al. Epstein-Barr virus-induced gene 3 (EBI3) can mediate IL-6 trans-signaling. J Biol Chem 2017; 292(16): 6644-6656. Doi:10.1074/jbc.M116.762021. Sghaier I, Mouelhi L, Rabia NA, Alsaleh BR, Ghazoueni E, Almawi WY, et al. Genetic variants in IL-6 and IL-10 genes and susceptibility to hepatocellular carcinoma in HCV infected patients. Cytokine 2017; 89: 62-67. Attar M, Azar SS, Shahbazi M. Interleukin-6-174 promoter polymorphism and susceptibility to hepatitis B virus infection as a risk factor for hepatocellular carcinoma in Iran. Asian Pac J Cancer Prev 2016; 17(5): 2395-2399. Fabris C, Toniutto P, Bitetto D, Fattovich G, Falleti E, Minisini R, et al. Gene polymorphism at the interleukin 6 -174 G>C locus affects the outcome of chronic hepatitis B. J Infect 2009; 59(2): 144-145. Cussigh A, Falleti E, Fabris C, Bitetto D, Cmet S, Fontanini E, et al. Interleukin 6 promoter polymorphisms influence the outcome of chronic hepatitis C. Immunogenetics 2011; 63(1): 33-41. Wujcicka WI, Wilczyński JS, Nowakowska DE. Association of SNPs from IL1A, IL1B, and IL6 genes with human cytomegalovirus infection among pregnant women. Viral Immunol 2017; 30(4): 288-297. García-Ramírez RA, Ramírez-Venegas A, Quintana-Carrillo R, Camarena ÁE, Falfán-Valencia R, Mejía-Aranguré JM. TNF, IL6, and IL1B polymorphisms are associated with severe ınfluenza A (H1N1) virus ınfection in the mexican population. PLoS One 2015; 10(12): e0144832. Lu Y, Peng J, Wang C, Zhu Y, Wang F, Sun Z. IL-6 promoter functional polymorphism-572C/G affects spontaneous clearance of hepatitis B virus infection. Clin Lab 2014; 60(11): 1903-1907.